ZERO is an espionage thriller that purports to be something deeper than an artistic tour de force of dynamic action set pieces and spectacular violence. In this first volume, AN EMERGENCY, writer Ales Kot teams with five distinctive artists to explore war, violence, love and loss amidst the eclectic chaos of our protagonist’s profession. A sense of melancholy and inevitable doom pervades ZERO. The narrative flits through time, providing glimpses into Edward Zero’s past, present and future, demonstrating the effect decades of trauma has had on his soul. Edward has been trained from childhood to be a cold, professional killer. His mandate is simply to get the job done, whatever the cost. Edward is a tragic figure, brutally moulded into a weapon, to be used and abused as his masters see fit until his inevitable expiration. ZERO mines elements from the best war and espionage fiction, but Kot’s approach is distinct – there is not another comic like this on the market, executed meticulously, with tangible consideration for each page and panel. Each chapter is illustrated by a different artist, whose styles bear no resemblance to each other. It’s a unique approach, and in a medium that lauds artistic consistency, it’s a remarkable feat. Tradd Moore’s chapter, in which a young Edward is tasked with his first assassination, is the standout artist amongst his esteemed collaborators, but nobody lets the ball drop; Michael Walsh, Mateus Santoloucu, Morgan Jeske and Will Tempest are operating on top form, and aided by Jordi Bellaire’s striking colors. Kot intersperses text pieces at the end of ZERO’s chapters, which prove essential reading, rather than gratuitous additional content. 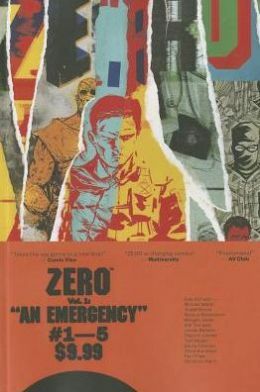 ZERO introduces various sci-fi elements into its narrative, including bio-modified terrorists and portals, but these fit the story’s tone, and add to the series’ grandeur. While readers seeking a gritty, real-world approach to their espionage fiction might blanch, it adds spice to Kot’s tale, and AN EMERGENCY’s finale suggests these paranormal components will play a vital role in the series moving forward. ZERO is a hybrid, and is on track to be an incredibly successful one. Framed as an espionage thriller, ZERO is so much more. It’s a wonderful example of ingenuity on the page, and of a writer weaving a tale with delightful creative abandon in tandem with a fine selection of collaborators. ZERO is not to be missed.